China is dismantling the ministry of railways into administrative and commercial arms to reduce bureaucracy and improve railway service efficiency. This news was revealed in a government restructuring plan submitted to the National People’s Congress (NPC) on Sunday. The new corporation would be open to private capital investment. “It means the country has removed the last ‘stronghold’ in the way of reforming the industry from a planned economy to market economy,” Wang said. The introduction of private capital in railway construction and operations will help break monopoly in the industry, a top official said on Monday. “It has been difficult for private capital to enter the railways system as the existing ministry of railways has the functions of both a government department and an enterprise,” said Wang Feng, deputy head of the state commission office for public sector reform. The proposed state railways administration, to be supervised by the ministry of transport, will fulfill the existing railways ministry’s administrative and commercial functions. Wang said the introduction of private capital will bring in competition and more diversified investment and operation structure will instill vitality to the railways industry. China’s cabinet has begun attempts to roll back red tape and reduce administrative intervention. 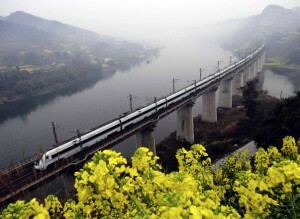 China is looking to invest $103.56 billion in 2013 for railway infrastructure.